The vivid experience of fighting in the First World War led many men and women to poetry. Far from the mud and trenches of the Western Front, soldiers fought in deserts and jungles and on mountains and beaches, showing us a very different picture of the global war. Here, Connie Ruzich writes about poetic remembrances of the war in Mesopotamia. 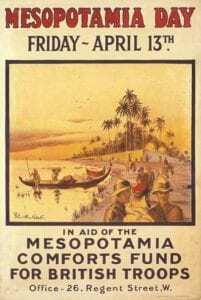 Posters from 1917 that attempted to raise funds for the British Mesopotamian Expeditionary Force depicted exotic tropical scenes. 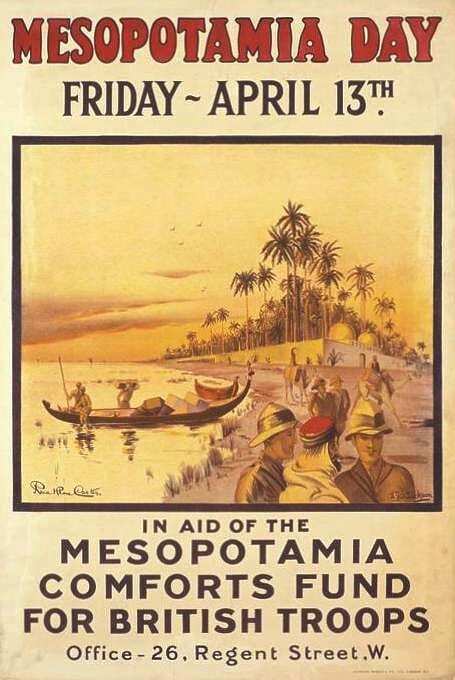 In reality, battles fought against the Ottoman Empire’s troops in Mesopotamia were fierce, and conditions were appalling. Summers were exceptionally hot, winters were bitterly cold, and the terrain ranged from mountainous deserts to swampy marshes. The siege of Kut was as bitter a military defeat as that suffered at Gallipoli, yet it is hardly remembered today. Beginning in early December of 1915, British troops found themselves encircled in Kut-al-Amara (a city in what is now Iraq). The siege began on December 7th; by the time British troops in the city surrendered on April 29th, 23,000 men had been lost to wounds, starvation, and disease, and the Ottoman army took 13,000 British soldiers as prisoners, many of whom died in captivity. Among the dead were many Indian troops. To the drum-beats of duty, the sabres of doom. 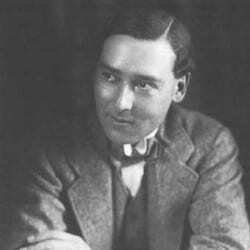 Born in Australia, educated at Oxford, befriended by Ezra Pound, and serving with the Mesopotamian Expeditionary Force, Fairfax’s poems were published in Mesopotamia: Sonnets and Lyrics at Home and Abroad, 1914-1919. He dedicated his poetry to Brigadier-General E. Dickson and Captain R.S. 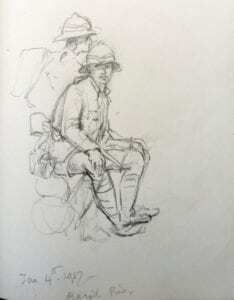 Aitchison, writing, “These verses are affectionately inscribed in memory of some peculiar and many pleasurable adventures shared while serving with the Mesopotamian Expeditionary Force 1917-1919.” Two short poems from Fairfax’s book capture scenes from the forgotten front in the Middle East. Sunders the light and shade. And the stars wake, one by one. Still today, clouds gather, winds blow, darkness falls – and the battle for oil, land, and power rages on. 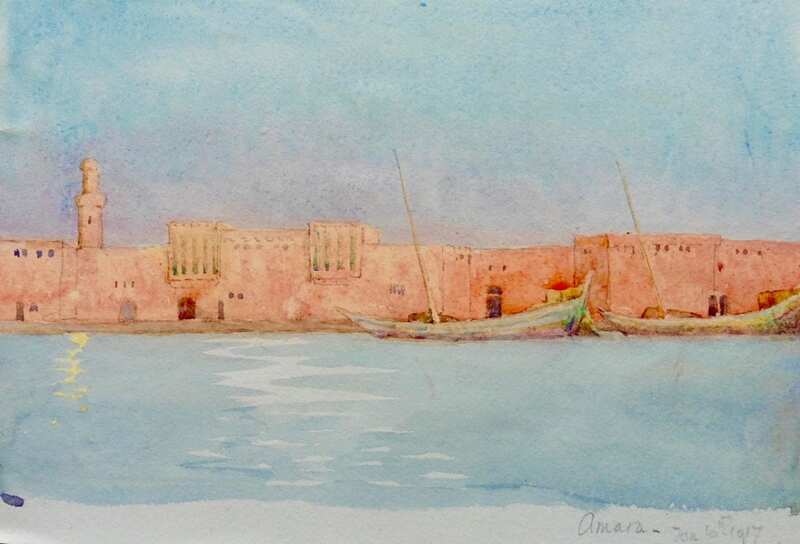 There is a timelessness in the landscapes of the Middle East that James Howard Stables, also a British soldier with the Mesopotamian Expeditionary Force, captures in his poem “High Barbary.” Stables was from Leeds, the son of a vicar. Early in the war, he left his studies at Christ Church Oxford to enlist, and he served with the 15th Gurkha Rifles in India, Northeastern Pakistan, and Mesopotamia. His small book of verse, The Sorrow that Whistled, was published late in 1916. Sweeping the ground with embroidered golden cope. —Go, gather up the fumes of frankincense. “Barbary” is the romantic name given to the coast of North Africa, and at a first reading, the poem appears to romanticise wars of the past, when Barbary pirates attacked merchant ships, raided cattle (“harried kine”), and pillaged Italian villages. The choice of the word “pillaged” itself is subtle and apt, for it has become a euphemism for the violence and terror that armies inflict on civilians during war, associated mainly with the distant past. The poem invites us to look out over an alien landscape, but to see deeper with the eyes of the imagination that cut “as a blade/Of dove-grey Damascene.” Damascus steel was famous for its use in swords and knives, but when used as an adjective, “Damascene” refers to a moment of insight that transforms one’s beliefs and attitudes – an epiphany. That transformation from the romantic glory of war to emptiness and loss occurs in the last line of the first stanza of this short poem: the ellipsis and stanza break demand that we pause and consider the consequences of the raids that have made the “land a desolation.” The second stanza continues the shift, as names of past and present combatants and victims are jumbled together in a Whitmanesque catalogue of war (“Huns” was a derogatory term used for Germans and “Walloons” are French-speakers of Belgium). Linked by their absence, “All, all are gone.” The words seem almost prophetic in evoking the “Lost Generation” who were killed during The Great War (an estimated 17 million dead). Clouds of death (perhaps also evoking the deadly gas that was used in the war) are “trailing hence,” while a “proud priest” in his finery emotionlessly continues the ritual of blessing. What are we to do or think? The poem commands us to do the impossible, as if no rational response to war can be made: we are to “gather up the fumes of frankincense.” More than anything, the poem is saturated with images of impermanence, of things that fade and are lost forever. Like so many others, Stables did not survive the war but died at age 21 in a battle near Baghdad in early 1917. He has no known burial place, as his body was never found. Wounded and left behind when the British troops withdrew, he is presumed to have died in enemy hands. His name, however, is on the Basra Memorial in modern Iraq. The Sorrow that Whistled is an unusual little book, as suits with its name. The writer, whom one takes to be young, revels in Eastern colour and fragrance. He can do something quite good and simple… On the other hand, he can do something extremely bad… Yet there is here a promise, and, not unconnected with it, indications that J.H. Stables is a young soldier. There could be no better school for a young poet who wants to shed the faults of youth than the trenches. 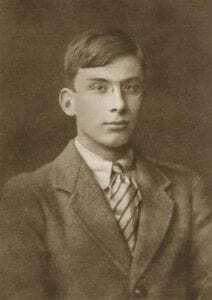 Another poet who wrote about Mesopotamia was Gerald Caldwell Siordet. 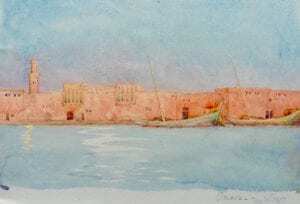 He was also an artist, and the sketch and watercolour below are his work. He died on February 9, 1917 while leading an attack on the Turkish position near Kut-al-Amara. His body was never recovered. 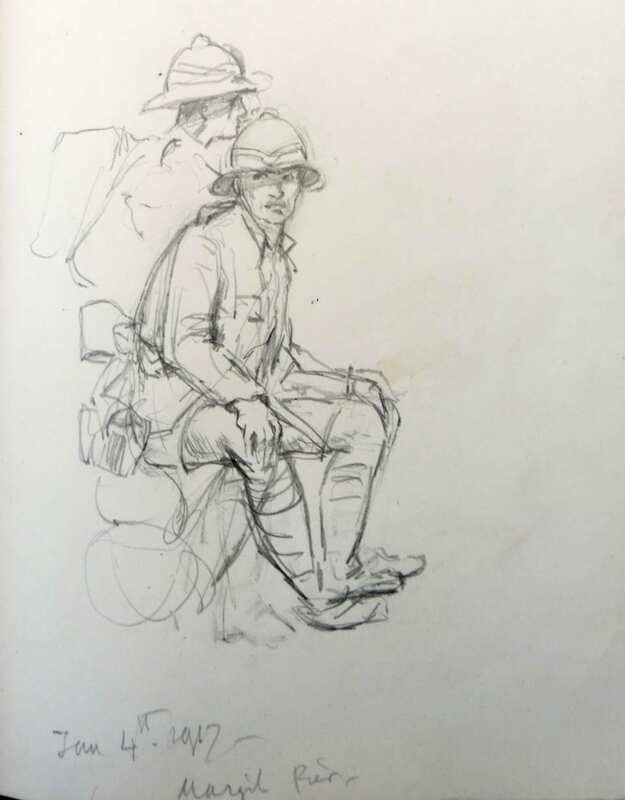 For those wishing to read more of the lost voices of the First World War, the blog Behind Their Lines shares international poetry written by both soldiers and noncombatants. Connie Ruzich is a University Professor of English at Robert Morris University near Pittsburgh, Pennsylvania. She has published on aspects of language, culture, and identity, and has lived and taught in the U.S., Italy, and the United Kingdom. Connie was a 2014-2015 Fulbright Scholar at the University of Exeter, where she researched the use of poetry in British centenary commemorations of the First World War. Her blog, Behind Their Lines shares lesser-known poetry of the First World War. Katharine Tynan, “New Books: War Poets and Others,” The Bookman, vol. 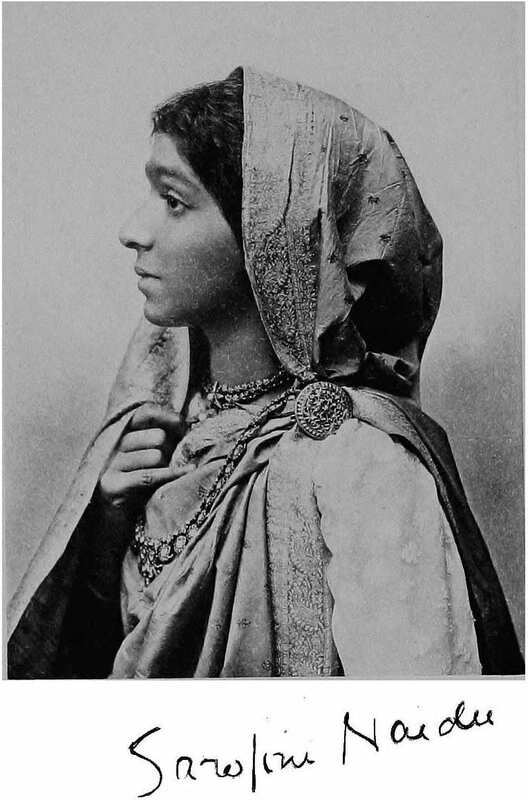 51, Oct 1916, p. 22.